OVERALL IMPRESSION: I really enjoyed this story, but I wanted more from it. I wanted to know more about Wick and Lily's dad and their relationship with him. I felt like this book was more of a rough draft for a book that could be more detailed and with more "meat" to the story. The idea was great and everything was well executed I just wanted more. The ending (last few chapters) of the book were really intense and suspenseful and I loved them. CHARACTERS: I really like Wick as the main character. She was relateable in the fact that she had to do everything she could in order to protect her younger sister, Lily. Griff was a good character as well, but I feel like there could have been more of him in the story. I would have liked a little more character development on him especially, but on all of the characters as well. COVER: The cover is very cool and creepy. 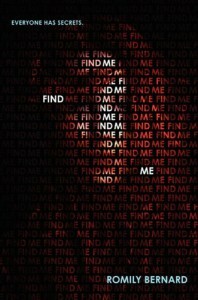 I love how the girl's face is made up of the words "FIND ME". The words themselves have relevance to the story as does the fact that they look sort of like code that a hacker would have to sift through. **I received an ARC copy of this book from Amazon Vine for my honest review.